A wall of local fieldstone bisects the Westport home of Geoffrey Stein and Patricia Poglinco, anchoring it to its midcentury roots. In this living room and throughout, designer Denise Davies celebrated the era with a balanced blend of vintage and contemporary furnishings. A finish of brick-red paint (Farrow & Ball’s Blazer) spotlights the front entry. In remodeling, Davies retained the living room’s original stone planting bed but reduced the foliage to a level more appropriate for her busy clients. The long, narrow family room presented a spatial challenge that Davies conquered with extra-slim walnut shelving and a custom sofa from Vladimir Kagan. The master bedroom’s built-in shelves, stocked with period treasures and dominated by Stein’s portrait of comedian Samantha Bee, float above the floor. The bedside nightstands, too, are suspended from the wall to visually increase floor space. The sculptural female form of this vintage lamp is partnered with a male version on the opposite side. The random flagstone pool deck is a throwback to midcentury summers. The artist’s weekend studio contains a custom built-in desk and enough room for recent works, in this case, likenesses of Jay Leno, Jon Stewart, and Chelsea Handler. Midcentury modern has become the hula hoop of the current decade. Look around, and you see everybody doing it. But few embrace the style with the dedication of Denise Davies. The founder and CEO of D2 Interieurs has spent decades collecting art, artifacts, and furniture from the days of Sputnik and Saarinen, Mad Men, and Mies Van der Rohe. 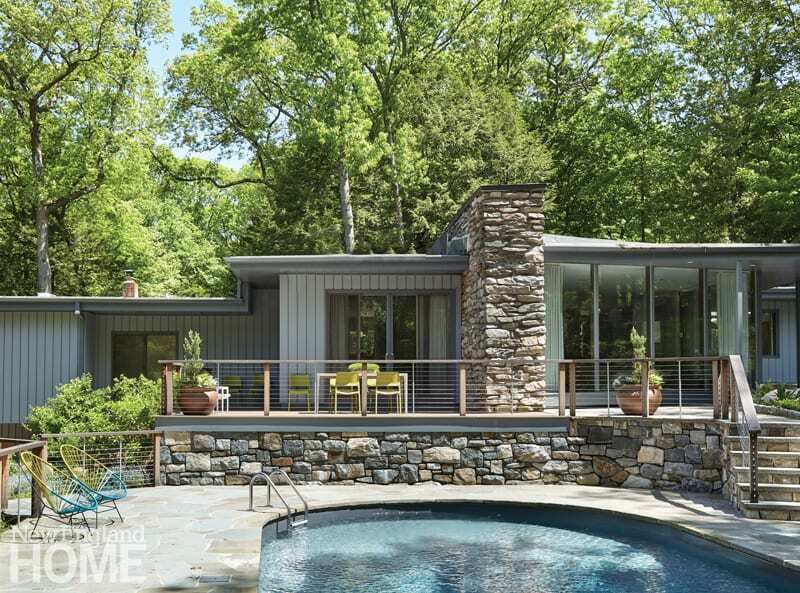 So when New York–based artist Geoffrey Stein and his wife, attorney Patricia Poglinco, went looking for a designer to restore the midcentury house they bought in Westport, their choice was obvious. They were impressed not only with Davies’s knowledge and use of vintage pieces, but also her knack for contemporizing the style. “Denise was loyal to the aesthetic but not a slave to the period,” Stein says. In projects like this one, Davies doesn’t stop at referencing the period in the chairs, coffee tables, and lamps she chooses. By taking on the task of landscape and architectural design as well, she envelopes all those selections in a virtual time capsule where past and present coexist. Her work honors the home’s origins, but doesn’t allow its design to become mired there. The single-level house bears familiar hallmarks of midcentury architecture. A thick fieldstone wall bisects the house, emerging out the back wall. Random slate floors in the entryway course through the center hall and into several rooms. In the slightly sunken living room, an indoor planting bed sprouts tropical foliage in the light of floor-to-ceiling windows. Although it mimics the style of well-known architects working in Fairfield County at the time, the home was designed and built in the early 1950s as a labor of love—and thrift—by a man named William S. Hinn and his wife. 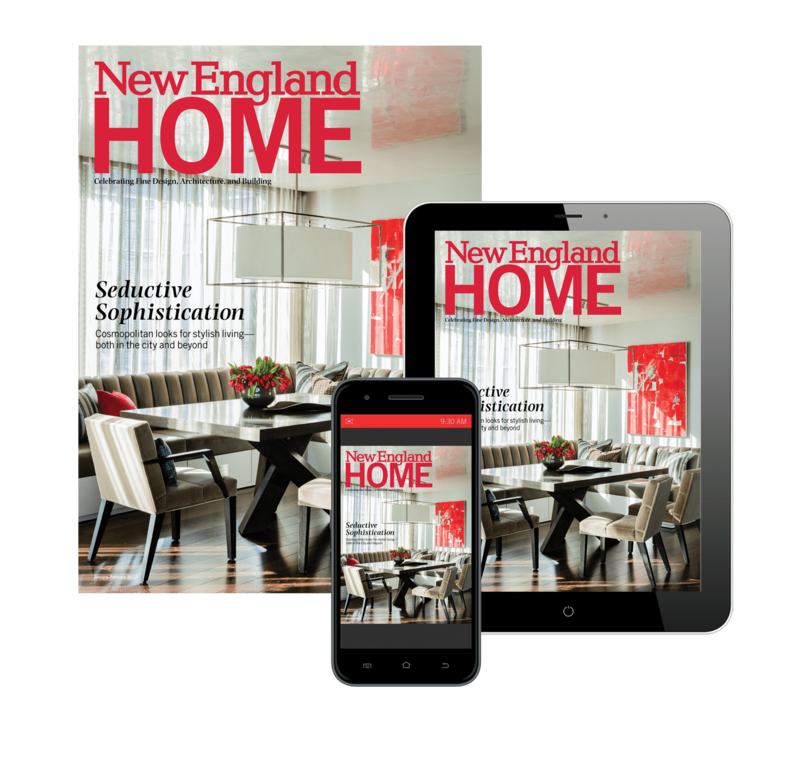 In 1951, House Beautiful magazine published Hinn’s account of his project, in an article titled “How to Get More House for Your Money.” Ten years later, the same magazine featured a photo of the living room on its cover, this time with a colonial-style wing chair backed against the stone wall. The structure was in good condition but would need a thorough overhaul, Davies recalls. “They wanted it to have all the character and the feel of the original, but they wanted it to be modern and comfortable,” she says. Calling in trusted collaborator Marek Bil of Old World Construction, Davies embarked on a full-scale renovation. The fieldstone walls were sandblasted and repointed, the HVAC and electrical systems were updated, and a new bathroom was installed. A kitchen renovation replaced the European cabinetry with a custom design by Davies that makes more efficient use of the space while opening it up to the dining room. The designer also drew on her experience to maximize comfort in the small rooms so common to vintage houses. In the master bedroom, she designed built-in shelving and nightstands that hang from the walls, visually opening up floor space. In the family room, she boosted the midcentury vibe with a wall of 1950s-style walnut shelves that are just twelve inches deep. The designer called in carpenter Michael Yedowitz to craft the cabinetry, which accommodates a flat-screen TV along with books and vintage curiosities from Davies’s vast inventory. The retro lines of the shelves and their curated contents make it hard to discern what is old, and what is new—exactly as Davies would want it. “It feels like it has always been there, because the style winks to the period of the house,” she says. A decorator, perhaps no—but an artist, yes. In many rooms, bold paintings and collages by Stein and other artists punch up the style more effectively than any decorator’s calculated dash of color. “He had this amazing, amazing artwork. That’s what really inspired the design of the house,” says Davies.